In the moments after winning yet another Kansas Class 4A-I title, Bishop Miege players and coaches could hardly summon the words to describe what they were feeling. “I can’t describe the feeling. It’s just…outstanding,” he said. For the fourth year in a row, the Stags came to Topeka’s Hummer Sports Complex, and for the fourth straight year, they walked away champions, this time dispatching Andale 47-7. The win caps an undefeated 13-0 season and clinches the school’s eighth football title overall. “We [the senior class] talked before the game, and we knew it would be a pretty special day if we could do it,” Putz said, a smile spread across his sweat-streaked face. Indeed, Putz leads a senior class that will graduate never having ended a season as losers. And the Notre Dame baseball commit was a large reason why yet again, wracking up 417 yards of total offense and five touchdowns against the Indians. Four of Putz’s scores Saturday were through the air to four different receivers. “He’s amazing. To have someone back there that can do the things he does, it just makes your job a lot easier,” said senior center Jack Burns. Putz leaves as the most prolific quarterback in Kansas prep football history. His four touchdown passes Saturday extend his state career record to 124. He also owns the state mark for career passing yards. Against Andale, the Stags started scoring early, taking the ball into the end zone on their first two possessions. Those drives were capped respectively by a one-yard touchdown dive by sophomore running back Brison Cobbins and a five-yard pass from Putz to senior running back Cameron Clark. The Bishop Miege students and fans—many of whom came with homemade signs that read “Four-Peat”—were raucous, their mood marred only by a muffed extra point and failed two-point conversion that left the score at 12-0. Even with the early scoring, Andale had a shot to make it game. At the end of the first quarter, the Indians briefly wrested momentum from the Stags when senior safety Parker Bruce intercepted Putz and returned the ball to set up Andale deep in Miege territory. Five plays later, quarterback Easton Hunter ran it in from three yards out to make it 12-7. Andale coach Dylan Schmidt said his team was discouraged by a few early penalties. “There were a few calls early that if they’d gone our way, things might have been different, a chop block and then a pass interference call against us. That was big. Those things swing your way, then maybe it’s a tighter game,” he said. Still, Schmidt admitted, a bigger problem was Putz and the Stag offense. Miege took the ball the ensuing possession after Andale’s score and marched 63 yards in just over three minutes. Putz hit senior wide receiver Peyton Hamrick on a five-yard slant to respond to the Indians’ touchdown. The Stags made the extra point this time to go up 19-7. “For it to be 12-7, then they took the ball right down and scored again: they responded, and that’s what good teams do,” Schmidt said. Andale carried in an undefeated record, too, and is a proud program in its own right, having won three titles over the past dozen years. They will move down to Class 3A next year with realignment. “Our kids did the best they could do. We’re proud of what we accomplished. We came in expecting to win, but we couldn’t have asked more of our kids,” Schmidt said. The game began to get out of hand for Andale midway through the second quarter, when the Stags’ signature quick-strike offense came through with the day’s most memorable play. On first down from his own 34, Putz found wide receiver Daniel Jackson streaking down the home team’s sideline. He hit the rangy sophomore in stride and after shrugging off a would-be tackler, Jackson took it home for a 66-yard score. The extra point made it 26-7. “They kept playing man [defense] on me, and Carter checked me to a go-route. And I knew I could beat them deep, and he threw it perfectly, and I just caught it and got up field,” Jackson said. Jackson finished his day with five catches for 123 yards and the long touchdown. He promises to be a standout on next year’s squad. 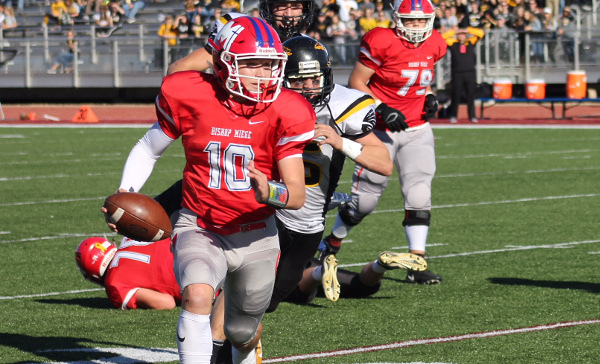 Bishop Miege continued to pour it on, scoring on three of their four drives after the half. Putz found senior wide receiver Quinn Schieber for his fourth touchdown on the opening possession of the second half. Putz would run in another score later in the third quarter. He finished with over 100 yards rushing. Clark capped the scoring with a one-yard touchdown run late in the fourth. He finished his final game as a Stag with 89 yards rushing and 44 yards receiving with two scores. On the field after the game, seniors like Putz and Clark celebrated by posing for pictures while flashing four fingers. Meanwhile, some under-classmen couldn’t help but think about next year, when it will be on them to continue Bishop Miege’s streak.